There’s been a long-standing theory that many of the Earth’s precious metals are not native to our planet but came instead from foreign bodies impacting on the surface. The theory that I was familiar with proposed that much of the Earth’s gold came from a single large impact billions of years ago. That was in an attempt to explain the lack of gold found in moon rocks. However Nature have recently published a paper stating that much of our gold and platinum came from a protracted series of impacts around 3.9 billion years ago over a period of around 200 million year That’s not to say that we don’t have alot of native gold and platinum but unfortunately much of that metal was had been dragged down towards the core during our planet’s formation. As the planet molten magma cooled the denser elements, including Gold would have been pulled towards the center of the Earth. They estimate that 20 billion bullion tonnes of matter slammed into the Earth over the course of this protracted bombardment, peppering the Earth with vast quantities of these precious metals. 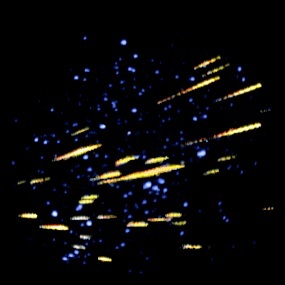 So when miners are digging gold out of the crust they are in effect pulling out the remnants of an ancient meteor shower. The red eye, the dead star and the comets!